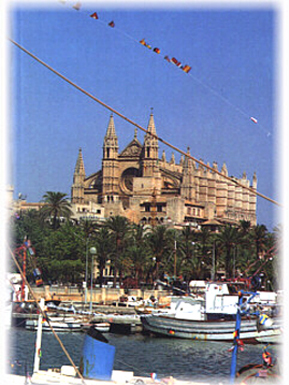 Disembarking at Palma, the capital of Mallorca, the largest of the Balearic Islands, then visiting the modern town with long tree-lined avenues and then the old town with its picturesque side-streets; a short visit to the wonderful beaches which stretch out to the East and West of Palma; a visit to Porto Cristo and the Drac Caves where there is an enchanting underground lake. For those romantic souls, a pilgrimage to La Cartuja, the former Carthusian monastery where George Sand lived with her lover Frederick Chopin. Passengers, who see the town for the first time, from the ship, are lucky as the whole town can be taken in with one glance. 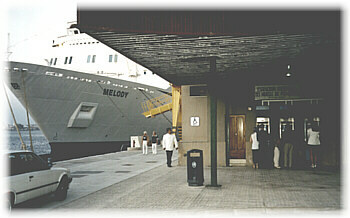 From the port the lively central avenue, Es Born, lined with elegant cafes and shops can be reached. Walking you can admire the Almudaina, previously a Moorish King's palace and now the national History Museum; the massive cathedral and the area around it, a fascinating web of little streets where Arab monuments remain intact alongside exclusive residences with cool stone patios. Declared a national monument, the Basilica the Sant Francesc has a gothic cloister noted for its Moorish influence. Amongst the palm trees, the Llotja is also worth visiting as it is one of the finest gothic secular buildings in Spain along with the Consejo Interinsular de Baleares, an elegant renaissance style building. This ancient town, founded by the Romans has other surprises to offer: on the road which leads to the market it is possible to visit important places such as the XVII century town hall and the old market place, Placa Major,Bellver Castle, a strong symbol of the island, dominates everything. It is one of the finest examples of military architecture of the XIV and XV centuries, although its circular golden stone structure gives it a strangely modern appearance. To finish with, you can visit the Poble Espanyol, an open-air museum displaying scaled-down exact copies of the most famous architectural treasures in Spain. A long crescent of white sand lapped by cobalt blue and emerald green coloured water, the Bay of Palma is dotted with delightful seaside resorts, ideal for sailing, sunbathing and having fun. To the west, Cala Mayor and Sant Augusti, with hotels, restaurants and discos. 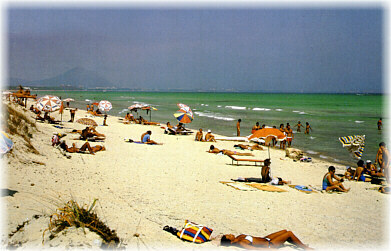 Then Illetes, with three islands which can be seen from the beach, Portale Nous,where you can probably go scuba-diving, Magaful,crowded and famous, with water sports, swimming pools and dolphin displays. To the east,Ca' n Pastilla offers good sports facilities, Las Maravillas and S'Arenal have the Son Veri waterpark. A trip out to Porto Cristo enables you to visit the Drac Caves which are more than 2km long allowing the visitor to see fantastic shapes, cleverly-lit. They also have imaginative names: Fairy Theatre, Diana's bath, and Ruined castle. The main attraction however is the Lago Martel, a tranquil mirror of water over a sound -and-light concert takes place. 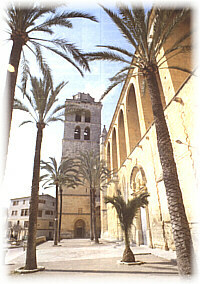 About 20km from Palma, the former Carthusian monastery of Valldemossa attracts tens of thousands of tourists every year. Although it was begun in the XIV century, the present complex dates from the XVIII century. In 1835 a government decree ordered the expropriation of the monastery which was coverted into apartments. In the desolate winter of 1838 the French writer George Sand lived there with her lover, the immortal Polish composer, Frederich Chopin. Their stay at Valldemossa was brief and unhappy but Chopin composed some of this most beautiful pieces there and even today lovers of music visit room number 2 where the couple stayed. Famous all over the world, La Corrida is the Spanish national "fiesta". This is true also in Palma, with its Plaza de Toros. Flamenco is the most famous of the traditional dances and this can be seen in the "tablaos", special flamenco nightspots found in most towns. Folkloric dances are organised almost everywhere and are always a pleasant and lively form of entertainment.